I knew that there was lots of weed cast up along the high water mark on my local beaches. Recently I'd heard from my pals that they'd seen a mullet surface feeding so when it came to the big spring tides I had no alternative but to give it a go. My pals Rob and Mike were also intending to try the same evening so everything was 'set fair'. Everything that is except the weather. When I arrived at the shore I could see that the sea was really rough. It was blowing a near gale from the south west and to be honest if I hadn't seen Rob's van in the car park I might have turned round and gone back home. However, it was on with the chesties, set up the rods and tramp along the shore to find my mates. It was still an hour or so to high water and although there was a big surf crashing onto the shore in my wet weather gear it wasn't too difficult to get along past the jutting sections of the cliff. After half-a-mile or so I saw the lads already fishing. Even at this range I could see that Rob was weilding his fly rod - this must mean MULLET, so I hurried along slipping and sliding in the weed piles and loose shale. When I arrived there were lots of mullet feeding on the surface. They were easily within casting range for the fly but there were several big problems. Firstly, the strong cross/onshore wind made casting difficult. Secondly, the pounding surf was rolling the boulders and it wasn't possible to stand anywhere near the breaking waves, this made it tricky to keep the line out of the breaking waves. Lastly, the water was full of weed debris which constantly wrapped itself around the line and fouled the hook. For once I had prepared for all contingencies. Anticipating problems with wind, waves and weed I had rigged my spinning rod with a bouncy ball float and a maggot fly dropper. As I baited up the fly with a few maggots I commented to the others that we might have a 'bit of a problem' in the event of hooking a fish. Anyway, we flogged away. Rob was fly fishing, Mike was spinning and I was using the bouncy ball system. Although the others were having difficulties reaching the fish and keeping the lures in position I found that the bouncy ball easily cast beyond the mullet shoals. 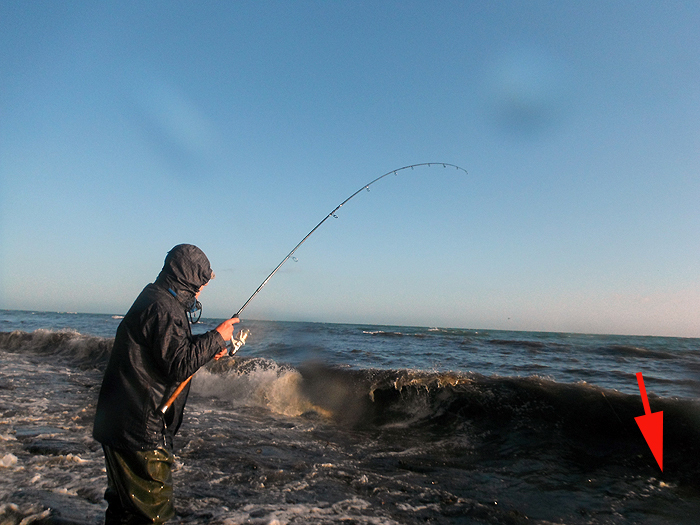 However, the wind caused a huge bow in the line and in the roring surf it was almost impossible to keep contact with the fly. It was a matter of crossing fingers and hoping for a take. An hour or more passed without any of us even touching a fish then, suddenly, the line tightened and I was in. A good mullet was tearing about on the end of my line. I shouted to Rob above the roar of the surf and he grabbed his camera. As he snapped away I played my mullet, round about four pounds to and fro. It fought hard but while it was out beyond the weed and breaking waves there was no problem. As the fish began to tire and I was able to draw it closer the real difficulties began. Bits of weed were clinging to the line and 'float' and every wave added to the problem. 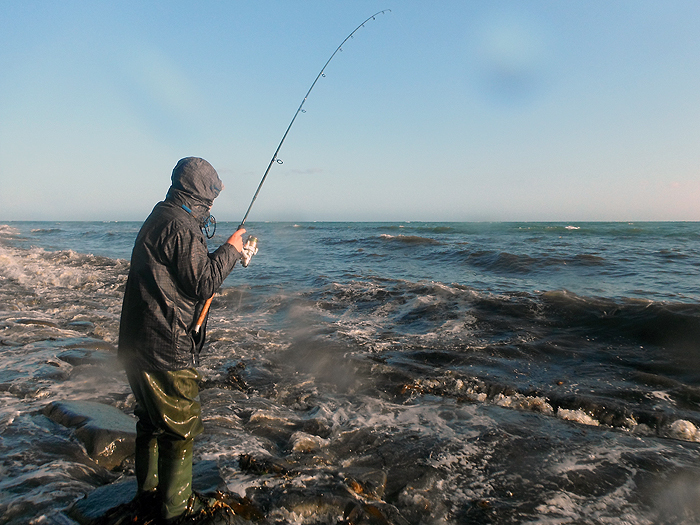 Eventually there were kilograms of weed wrapped round the float and the fish was in the surf. Rob offered to plunge down and grab it but the risk of a soaking or a broken ankle was too great so I told him to 'leave it!'. Eventually the pressure was too great and even though I'd upped the strength of my cast to 10lb nylon there was a ping and everything had gone. Ah well, that's fishing!!! !